As we await the start of the new season and that easy away game at Old Trafford (and cheered up by the Lionesses in the women�s World Cup), let�s play the selecting game. My regular reader here at Spurs Odyssey will know that I have been a continual critic of the so-called �Ultimate Spurs Team� that was chosen on the official club website. Now I am going to fight back for the Golden Oldies generation by presenting MY ultimate team based on 65 years of Spurs-watching, plus the side picked by the best judge of all � master manager, Bill Nicholson. Back in 1982 I scripted the first-ever official VHS history of Tottenham Hotspur to mark the 100 years anniversary of the club. It is almost an antique now, and has never been transferred to the DVD format. If you possess a tape you�ll see that good old Jimmy Greaves is the presenter at around the time he was launching his career in television, and I am identified in the credits as the scriptwriter. It was so long ago that I am sure there will be some who do not even know what a VHS tape is! 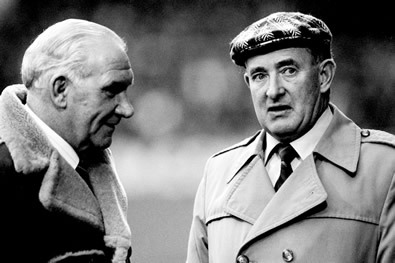 In the publicity drive for the project, I got the one and only 'Sir' Bill Nicholson to name the team he would most liked to have managed from all the players involved at the club during his four-decade service as a Spurs player and manager. Bill said of his selection: �I had no hesitation in picking Jennings in goal, and the only other contender was Ted Ditchburn, who played such an important part in our Push-and-Run successes. �Alf Ramsey was comfortably the best right-back England had in my time playing the game, and there have been few left-backs to match the combination of skill and tackling strength of Cyril Knowles. �Mike England and Ron Burgess would have been perfect partners at the heart of the defence, Mike with his command in the air and Ron with his all-round game. For me, he was the greatest player ever to pull on a Spurs shirt. �Blanchflower and Mackay pick themselves in midfield, Danny for his leadership and inventive mind, and Dave for his strength, competitive drive and ability to motivate team-mates. �The main scheming role goes to Eddie Baily, just ahead of dear John White. It was Eddie�s long-distance passing that swayed it for him. He could land a ball on a handkerchief from thirty yards. �I have picked Cliff Jones to bring his sprinter speed to either wing. He was without question the bravest winger I ever saw, and I used to wince when he made those diving headers that were his trademark. Ledley King is in my opinion the finest Tottenham defender of the last 20 years, and I had to get him in my team. I settled for putting him at left-back, a position in which he played several times in his early days at The Lane. It really hurt leaving out the wonderful Cyril Knowles, who earns a place on the subs bench along with Ted Ditchburn, Bobby Smith, Steve Perryman and Paul Gascoigne. Glenn Hoddle, the pass master, gets the nod just ahead of Eddie Baily as my chief playmaker, because he was hungrier for goals. It is difficult to think of a more prodigious British midfield pairing than Hoddle and Mackay. I�ve got the blinding speed and silky skill of Welsh wizards Cliff Jones and Gareth Bale on the wings, and I have brought the G-Men together as my goal gourmets. Gilly gets in just ahead of beefy Bobby Smith and the at-times majestic Martin Chivers, because Jimmy has always told me the elegant Scot was his favourite side-kick. What I�m hoping is that this time next year Harry Kane will have had such a great couple of seasons that he will force himself into the Ultimate Spurs team. I�m sure you will all vote for that to happen! The club runs ten teams, from Under-10s to seniors. They can feed off the success of the ladies� international team, and any new recruits are certain of a warm welcome. It�s World Cup semi-final day on Wednesday, when England take on the holders Japan, and as it is being played in Edmonton it gives us a Tottenham link even if we do not have any representatives on the pitch! The majority of you got last week�s answer correct: Who was Tottenham�s first �1m-plus signing and with which club did he start his League career? Yes, it was Paul Stewart who started his League career with Blackpool. He was an early addition to the team in the eventful era of Terry Venables, and Blackpool got a share of the then record �1.7m fee when Paul arrived at The Lane from Manchester City. First name drawn from the correct answers is Brian Taylor, from East Barnet. I will email a screen version of one of my Tottenham-themed books to Brian, who has been a Spurs supporter for more than 50 years. This week�s teaser: Which former Newcastle and Spurs skipper has been capped 18 times by England, and with which London club did he start his League playing career?